Force trees and branches. Forsythia is traditionally “forced” to produce early, indoor spring flowers, but did you realize you can do this with many trees and shrubs? Not only can you enjoy the bright splash of yellow from forsythia, but also pink flowers of a honeysuckle or the fragrant purple flowers from a lilac. 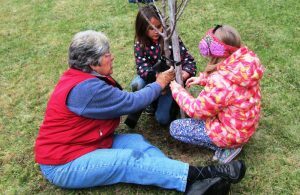 Purdue University Extension has a helpful fact sheet, Forcing Branches for Winter Color (PDF), that describes which tree and branches work best, their flower color, shapes and pattern, and some secrets in order to have a successful collection of flowers early in the season. Start seedlings indoors. Through March you could be well into your seedling startup program. In fact, for some plants such as onions, parsley, and lisianthus, it may be too late. To learn more about start times for many of the common seedlings, check the interactive seed-starting table developed by Johnny’s Seeds. 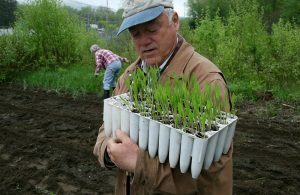 And if you are looking for ways to improve seedling success, see Bulletin #2751 Starting Seedlings at Home, which contains many useful tips for starting seedlings at home. The video in the bulletin walks you through the building of a seedling stand. Plans and a materials list for building a seed stand are included. Get your garden planning off to a good start. Smart Gardener: A Learning Guide for Home Vegetable Growers, a step-by-step manual for laying out a vegetable garden and selecting and placing vegetables within the garden, can also help you learn how to identify and manage insect, weed, and disease pests. The manual is currently available at a reduced price of $4.00. Join a garden club. Another way to expand your knowledge and make new friends interested in gardening is to join a local garden club. 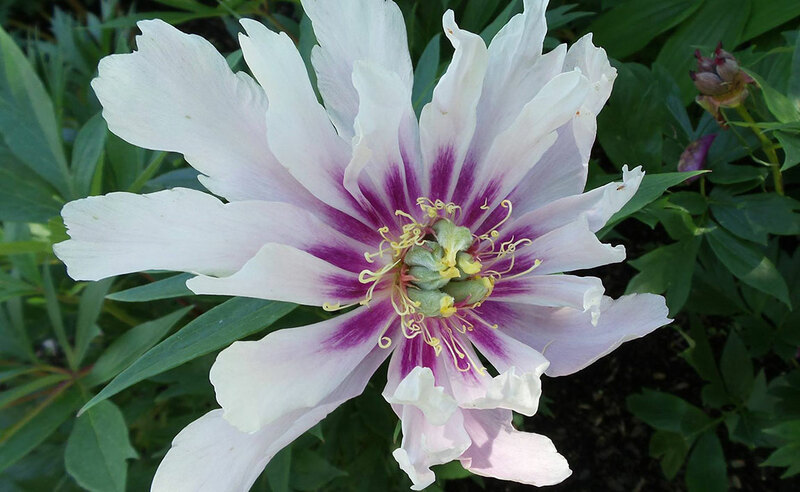 A list of many Maine garden clubs with contact information is available at the Maine Garden Club Federation. Attend a flower show. These shows are great place to learn, interact with others, gather information, and see new products. 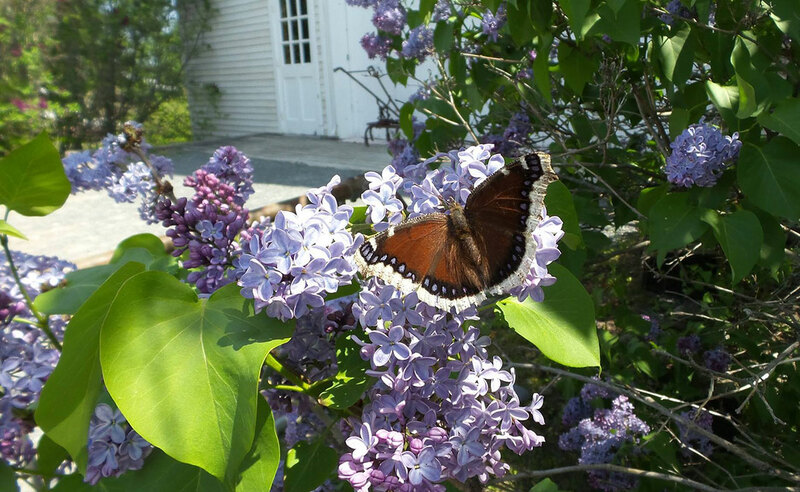 Grow it right while supporting the Maine Master Gardener program. Purchase your raspberries, blackberries, rhubarb, asparagus, several varieties of blueberries, and strawberries through the “Grow It Right!” Benefit Plant Sale, and proceeds from the sale will help support a variety of Master Gardener Volunteer projects and scholarships throughout the State of Maine. Visit a Maple Sugarhouse on March 22, 2015 to get a firsthand experience of the maple syrup “boiling off” process, and enjoy many other possible offerings, too, such as pancakes, ice cream, sugar bush tours, and maple products. Find these open houses on the Maine Maple Producers Association’s Maine Maple Sunday website. Learn which vegetable varieties work well in the Maine growing environment in Bulletin #2190, Vegetables for Maine Gardens. Suggested varieties are available in most of the popular seed catalogs as well as catalogs produced by more local seed production businesses. Like many other Mainers, you are probably quite ready for growing season to begin. You have likely started a list of things (on paper or in your mind) that you want to accomplish in your yard and garden this year. I would like to present some additional challenges for you to consider for this growing season. Some of these challenges might not fit perfectly, while others will strike a chord. Plant something completely new to you. 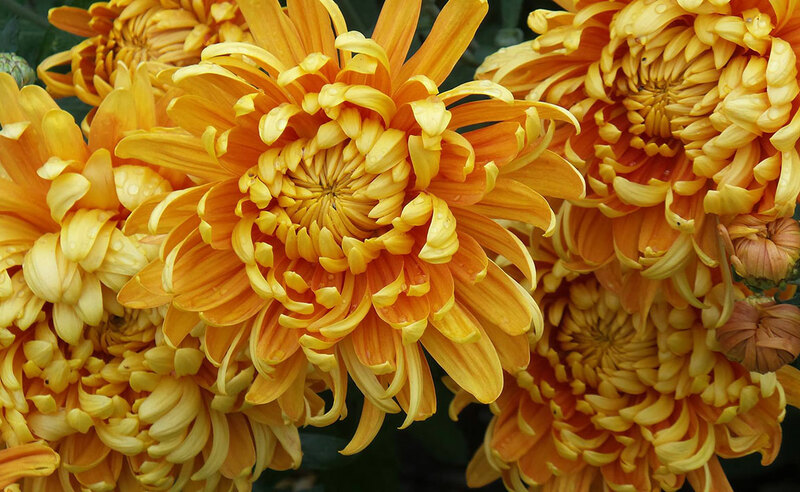 This might include a new cultivar, variety or type of flower, shrub, tree, vegetable, fruit or herb. 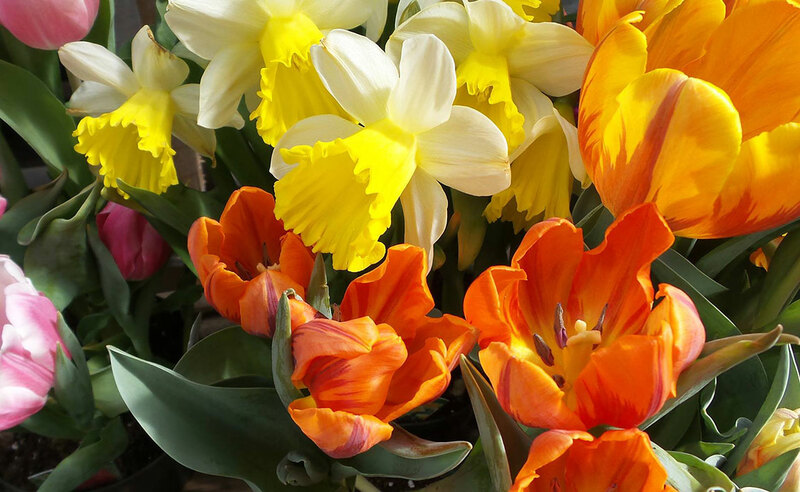 Visit your local garden center and ask what’s new and exciting. Perform an Internet search seeking new plant materials. 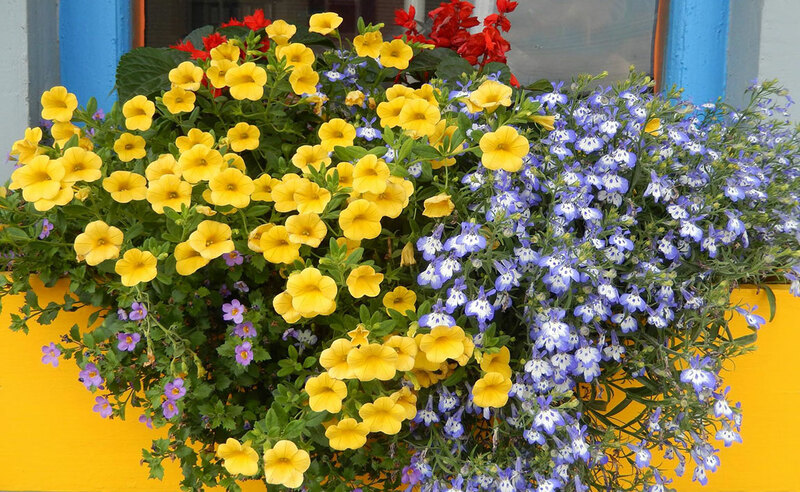 Make sure the plants are suitable for your plant hardiness zone. 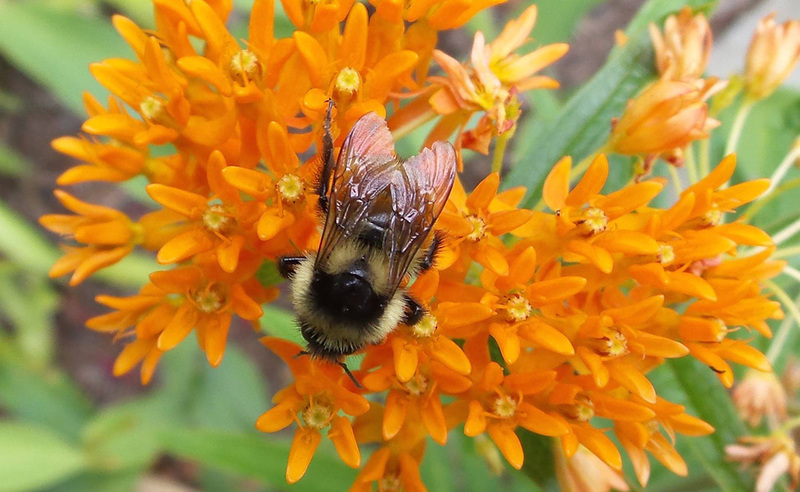 Encourage your friends to subscribe to the Maine Home Garden News and read timely garden articles for the Maine gardener, as well as a listing of topical videos and publications produced by University of Maine Cooperative Extension. Subscribe to a gardening magazine for one year and read it cover-to-cover as if you are a new gardener. In addition, pour over the advertisements in looking for new ideas, methods and techniques. Set a goal to teach someone special about gardening this year. This “special” person might be a child, teenager, neighbor, relative, an immigrant, an elderly person, or a person with a disability. There is someone in your life who could surely benefit from your attention, skills, and knowledge about gardening. Identify this person by June 1 so they can experience an entire gardening season with you. Take a gardening course on a topic that is interesting and challenging to you. This course might be offered through your local adult education program, garden center, cooperative extension system, community college or another university. Perform an Internet search and include “online course” along with the topic. 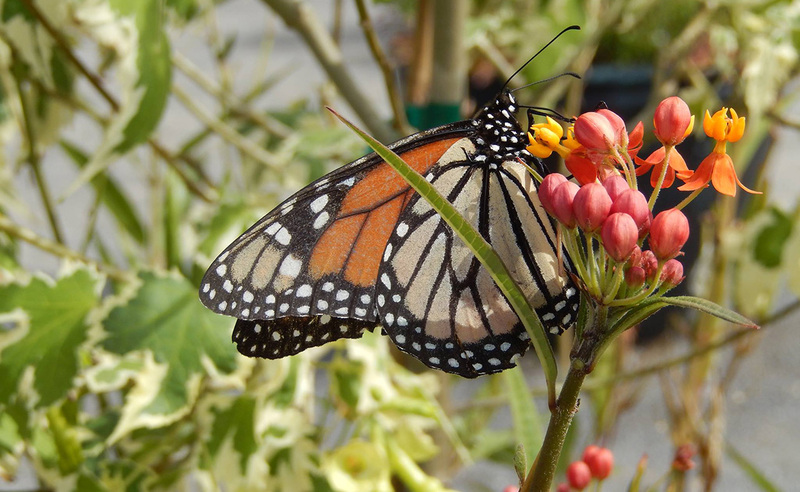 Here’s a sampling of links to online garden-related courses being offered. Grow a section of your garden with the specific purpose of preserving or storing part of it for later use by your family. Visit your local library or favorite bookstore and peruse the gardening section for books that interest you. Consider purchasing a copy of your favorite gardening book for your town library or city library. Check with the librarian to arrange for such a purchase. Consider volunteering at your local soup kitchen or food pantry for day or a set of days to better understand the plight of those less fortunate than you when it comes to food. If you do this near the beginning of the season, you might be able to grow vegetables specifically for distribution. Check out you local garden club and plan to attend at least one meeting as a guest. Learn about their purpose and their calendar of events for 2015. Consider joining. 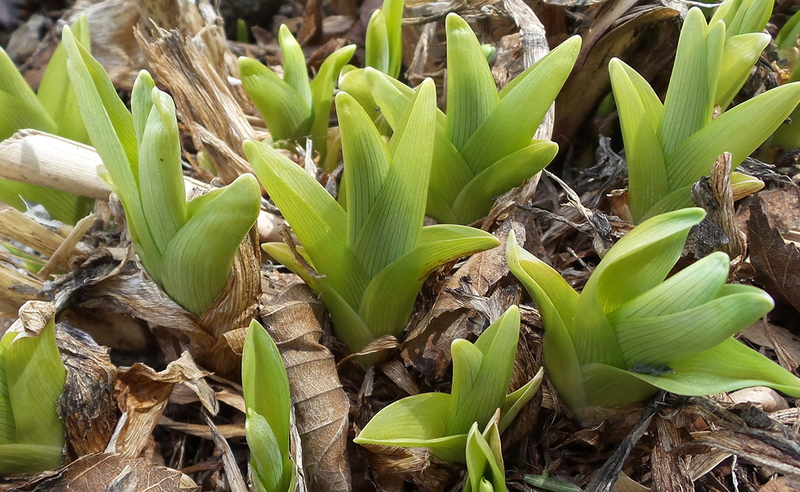 Commit to “scouting” your gardens on a weekly basis this growing season with an eye out for insect pests or diseases. Consider planting an edible landscape. “Edible landscaping” is the practical integration of food plants within an ornamental or decorative setting. If you have lacked adequate vegetables in past growing seasons and feel that 2015 will be similar, try making arrangements to purchase a share (partial or full) from a local CSA farm. There are over 150 Community Supported Agriculture (CSA) farms in Maine. MOFGA maintains a directory of CSA farms with additional CSA’s listed on the “Get Real Maine” website. When you get to the site, go to Farm Filters — move to Business Focus Retail and there’s a drop down box for CSA. If you haven’t grown a garden ever or it has been a long time since you had a garden, planting a garden seems intimidating and overwhelming to some folks. 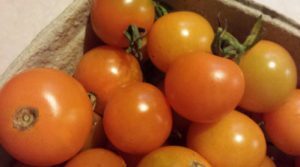 To try to encourage more people to grow their own vegetables, UMaine Extension Piscataquis County Executive Committee funded the One Tomato project. Folks were given one tomato plant to plant in a container or garden to take care of and harvest during the growing season. They were given fact sheets on container gardening and could sign up for a newsletter or view Facebook postings. Flats of cherry tomatoes (Sun Gold, Sweet 100’s, Yellow Pear, etc.) were separate into individual plants and given out to 170 people at the UMaine Extension office and food cupboards (one plant per person) in Piscataquis County with fact sheets on container gardening and an offer for the electronic Piscataquis and Penobscot Counties Gardening Newsletter. One-hundred-seventy completed a survey. Fifty plants were given to a prison garden that provides food for the food cupboards. 30 (18%) of survey respondants said they had never gardened and this would be their first garden, 23 (14%) had only gardened 1 to 3 years. 59 (35%) signed up for the electronic newsletter. 106 (65%) of the respondants said they would put their tomatoes in a container, 10% a raised bed garden, and the rest straight into the flat ground. 30% had never heard of UMaine Extension before. Over 50% had received gardening information, 10% farming, 16% 4-H and Youth, and over 27% food preservation information from UMaine Extension. A card with UMaine Extension contact information was included with plant to show where to call for more information about growing tomatoes and where to share the progress on Facebook. Both Donna and Ana were stopped and told by people who had gotten a plant that they had planted it and it was doing well a week after they received it. Someone dropped off broccoli and cauliflower plants that were also distributed. The director of one food cupboard thought only 25% to 50% of folks would take a plant, but that day 63 of the 90 folks who came to the cupboard received a plant or 70% of the folks. During growing season EMGV and UMaine Extension staff followed up on Facebook and at food cupboards to answer any gardening questions and to see how successful folks were at planting and growing tomatoes. Two electronic newsletters were sent to 59 people with 15 and 9 opens or an open rate of 25% and 15%. There were 11 Facebook postings that reached a total of 1,202 with 144 clicks and 72 likes. 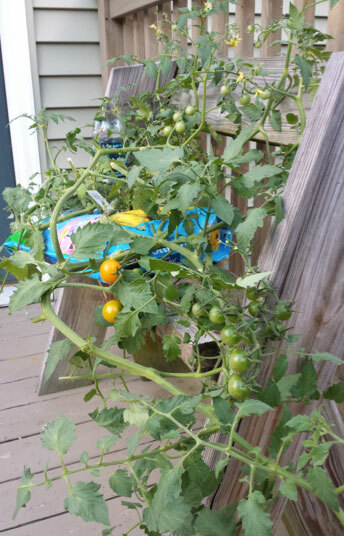 Images showed the progress of a bagged tomato growing on a bench. 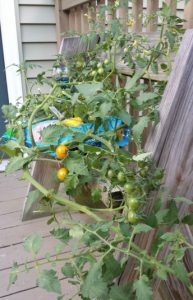 A mid-season (38 gardeners) and end-of-season (39 gardeners) evaluation was completed by attending food cupboard sessions and asking those who came if they had gotten a tomato plant in the spring and what happened with it. Master Gardener and UMaine Extension staff did the oral interviews. The gender of those responding was 23% male and 77% female. They planted their tomatoes either in the ground (56%) or in containers (44%). Plant health was rated at good (81%), bad (14%) or the plant died (5%). At the end of the season 19% had no harvest, 38% harvested a handful of cherry tomatoes, 19% harvested a bowl full, and 25% said they harvested a bucket full of tomatoes. If the handful was valued at $1, the bowl full at $5, and the bucket full at $10, then the estimated value of harvest of all 220 folks receiving tomatoes was $830. What a winter it has been! We are all looking out on endless expanses of white snow. What better time than now to dream in color? And here is a splendidly beautiful and fun addition to your garden this year. 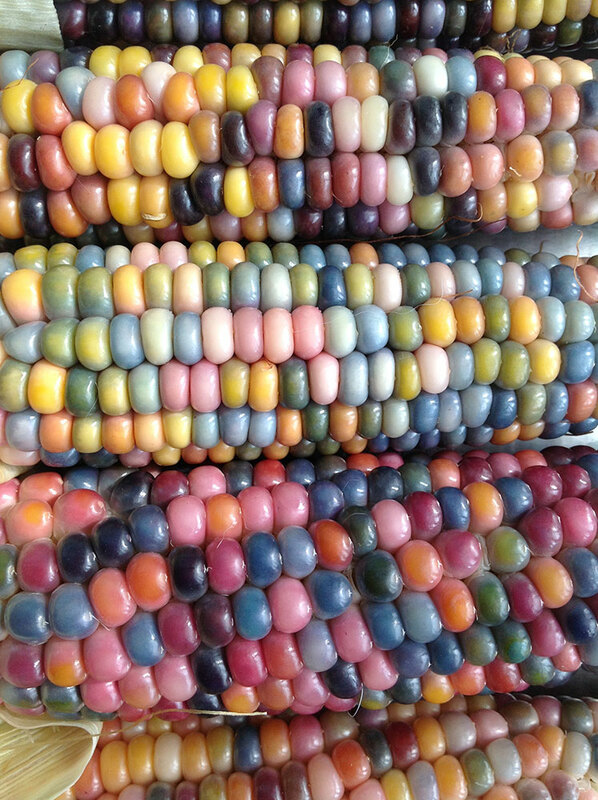 Glass Gem Corn, botanical name Zea Mays, is being referred to as “the most beautiful corn in the world.” It is a flint corn that produces a gorgeous rainbow of glassy gem-like kernels in every hue and degree of color intensity. At harvest in late September/early October, it is like opening one totally unique gift after another…an amazing experience. 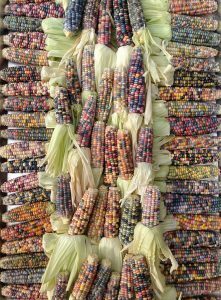 While it is appreciated most for its decorative qualities, it can also be popped, or ground into corn flour as Native Americans have traditionally done. The stalks can reach 7 to 9 feet tall, and they are decorative on their own, with streaks of purple. It is a long season corn and well worth the wait. Growing glass gem is an especially fun project to do with kids. The UMaine Extension Kids Can Grow program did this last year in York County in a raised bed, and the kids went pretty wild over it. What a fun project that was! 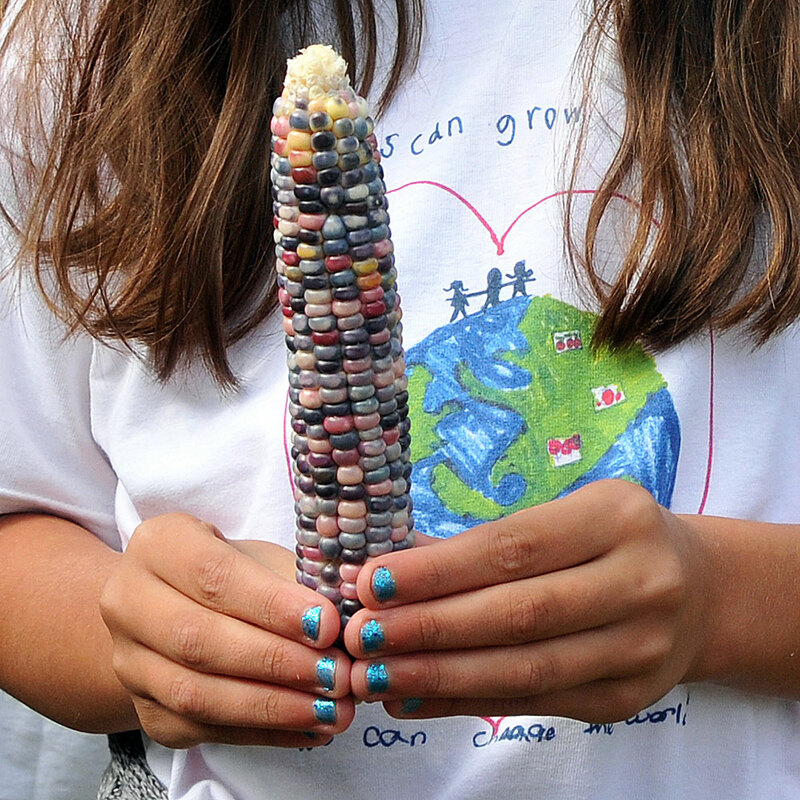 Glass Gem Corn first became available to the public in late 2012. 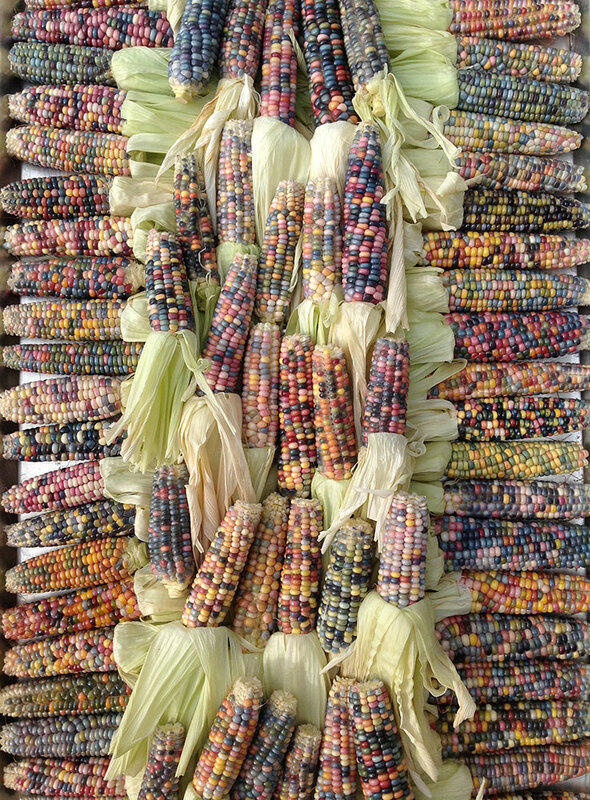 There is a very unique history behind the development of this corn. “Cherokee rare corn farmer Carl Barnes spent years isolating Native American corn varieties to save a lost heritage, ultimately preserving his glass gem corn seed…. These are the seeds that sing.” –White Eagle/Carl Barnes. As Carl Barnes got older he entrusted his precious seed collection to a friend he had been teaching all about this special corn. And the corn seed was grown, protected, and saved until it was finally made available three years ago to us gardeners and farmers. 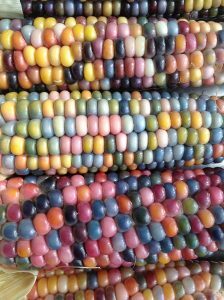 I encourage you to read The Origins and Journey of ‘Carl’s Glass Gems’ Rainbow Corn by Greg Schoen, an excellent article that describes in great depth the history of this corn and the Native American spirit that it represents and contains. If you are interested in more information or obtaining seed, you can e-mail me at azhopkins10@yahoo.com. I have grown out good size crops here in northern York County over the past two years to maintain genetic diversity. It’s late winter, which means it’s time to start planning your garden. While the beds are covered with snow, Maine gardeners can take the time to identify our goals for our gardens as they relate to preserving. Planting your garden with preserving in mind can increase efficiency, decrease waste, and lessen the stress around harvesting and preserving in late summer. Before you begin, identify your preserving goals. Do you want to feed your family year round from your garden? Do you want to avoid purchasing store-bought canned tomatoes? Do you want a few jars of specialty pickles to give as gifts at the holidays? When deciding what to plant, consider what you purchase regularly at the store that you can make at home, what is expensive to buy (i.e. fresh fruit out-of-season), what is easy to grow in your area, and what your family likes to eat. Some vegetables that are easy to grow and preserve are tomatoes, cucumbers, and green beans. Tomatoes can be canned whole, halved, or crushed in water; made into salsa; or frozen. See UMaine Extension Bulletin #4085 Let’s Preserve Tomatoes for these specific recipes, including instructions and processing times. Use a Roma or paste variety, as they have less water content and will cook down into sauce quicker than slicing or salad tomatoes. 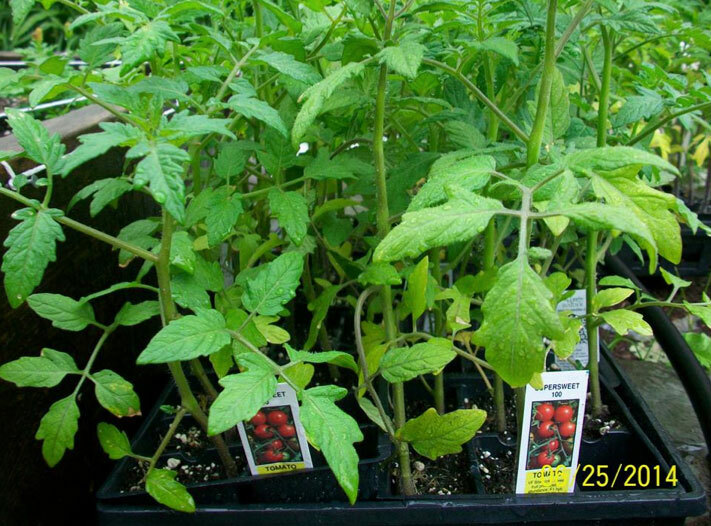 Check the seed packet or ask your greenhouse employee or farmer to find sauce tomatoes varieties. Green beans can be pickled, pressure canned, and frozen. See UMaine Extension Bulletin #4046 Let’s Preserve Snap Beans for specific recipes. Consider succession planting for staggered harvests, over a large harvest that arrives all at once. Cucumbers are also easy to grow and great for pickling. Choose a pickling variety, which has less water content, and will give you crunchier pickles than a salad variety will. See UMaine Extension Bulletin #4044 Let’s Preserve Pickles for recipes and processing times. 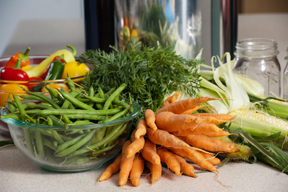 Specific recipes on the National Center for Home Food Preservation website include how many pounds of produce you need for a canner load of jars. Use a vegetable planting guide (PDF from Montana State University Extension) to determine the yield of plants and that information to inform how many plants to plant for your household’s needs. Putting up your homegrown produce is very rewarding, and with a little planning this time of year, you can increase your effectiveness at preserving that produce in a jar or in the freezer. For more information on preserving your garden’s yield, check out our schedule of hands-on food preservation classes.